The names of the 710 men of Hyde who fell in the First World War are not recorded on the Cenotaph on Werneth Low, but they are recorded on panels in Hyde Town Hall. 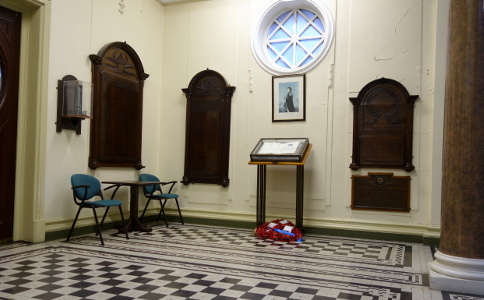 There are six First World War panels (along with other memorials). At the top of each panel are the words - "In memory of the men of this borough who gave their lives for our country"; and at the foot - "Make them to be numbered with thy saints in glory everlasting." During the first few weeks of the War, German forces swept through Belgium attempting to reach Paris. This invasion forced tens of thousands of Belgians to flee their homes with many finding their way to British shores, most with nothing more than the clothes on their back and what they could carry. Between October and December 1914, 137 Belgian Refugees arrived in Hyde. Not one could speak English. The eldest refugee was a lady 70 years old and the youngest a child aged 18 months. Upon arrival the refugees were first housed at the old isolation hospital at Gee Cross (now the site of Alder High School). The refugees were then given homes and jobs with the people of Hyde for the duration of the war. Some of the refugees were skilled cabinet makers who used their skills to help make furniture for the refugees in their new homes. 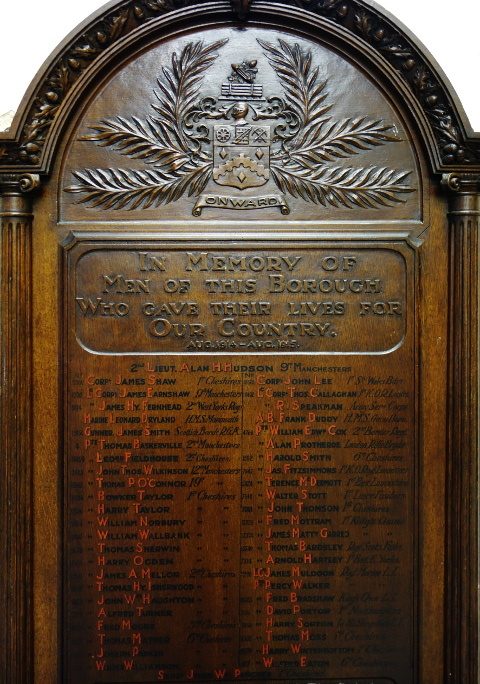 When the war ended, to say thank you to the people of Hyde for their care and support during the war, they made a number of beautifully carved oak War Memorial panels displaying the names of the 710 Men of Hyde. 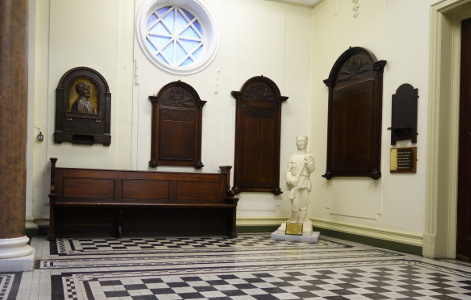 These panels are on permanent display at Hyde Town Hall.